Happy August, all! We're about halfway through our Cozy Up To Summer month of giveaways, and to celebrate the August new releases we have a super giveaway planned. Win one of these three book prize packages by leaving a comment here naming one of the above new releases in your comment! US and Canadian addresses only, please! So... please leave your name, and your email address (yourname (at) yourserver (dot) com, if you like, to avoid the spambots picking it up) by 9 am, August 2nd. *PLEASE NOTE... packages will be awarded as shown, no substitutions, and in the order your comment is drawn by random numerical draw. Cracked to Death by Cheryl Hollon; The Diva Serves High Tea by Krista Davis. Prize Package #2 - Books: Toasting Up Trouble, by Linda Wiken; To Catch A Treat, by Linda O.
Johnson; Much Ado About Muffin by Victoria Hamilton; Read to Death by Terrie Farley Moran. Knot The Usual Suspects by Molly MacRae; The Grim Steeper, by Amanda Cooper. What a wonderful giveaway! Clock and Dagger is a series new to me, thanks for the heads up! What a terrific prize package. And another month of so many books and not nearly enough time. I want to read them all, but Silk Stalkings by Diane Vallere is one I already know will be laugh out loud funny and a great read. Thanks! Super giveaway - thanks! Looking forward to Much Ado About Muffin and would love to win #2. Looking forward to "Clock and Dagger", "Silk Salkings" and "Read to Death". Have already read a few of the books. It's going to be a great August! I am looking forward to catching up with Merry and the gang in Much Ado About Muffin, And a first in the series, Death Among the Doilies, looks good too. Thanks for the chance to win! All these books look so great. I can't wait to read The Diva Serves High Tea. Thank you for the chance! I'm super excited about all the book releases tomorrow! Will be going to the bookstore for sure! I can't wait to read Silk Stalkings & all the other new releases! Thanks for the giveaway. All the books sound interesting. The title that caught my attention was Much Ado About Muffin. Thank you for such a great giveaway! I will pick Prize Package #2 because I have several of the books in the other two packages. They are all books I would enjoy! I love reading cozies! Thanks for the great giveaway—I'm especially looking forward to reading The Grim Steeper! I would love to read Silk Satlkings. Diane Vallere is a new author to me. Thanks for the giveaway! I am actually a newbie to the cozy mystery genre and have only read a few authors, one of them being Victoria Hamilton. I really enjoy her Merry Muffin and Vintage kitchen books. I'm looking foward to reading Much Ado About Muffin. Awesome giveaway contests! Thank you for sharing! Nice array of authors, books and covers. The giveaways were plotted out very well and I enjoy knowing what giveways and books are out there. As far as I am converned this is a public service announcement. Great giveaway. There are so many new books coming out this month. I hope I have enough funds to get them all. Thanks Lois R. @ rainonlois@aol.com. What a super giveaway! I love the cover of Silk Stalkings---the color is just so vivid. What a wonderful way to spend the rest of the summer evenings, reading great books! I love the Linda O. Johnston series. I just read To Catch a Treat but haven't read any of the other books yet. I pretty much love all the books in the giveaway. But the hardest one to find in any local county library will be Much Ado About Muffin. So I hope I'm your second lucky winner. I love the Merry Muffin series, so I cannnot wait to read Much Ado About Muffin! What a wonderful giveaway. So many great authors/titles in each package. I just finished Silk Stalkings. It was wonderful. I'm looking forward to The Diva Serves High Tea, Much Ado About Muffin, The Grim Steeper and all the rest. I love the covers as well as the authors. I think Cozy Mysteries have the most attractive covers. I love this giveaway. Thanks for the chance. Silk stalkings. 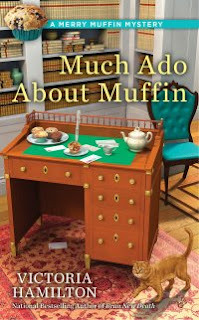 Much ado about muffin sounds as if it would be a cute series! 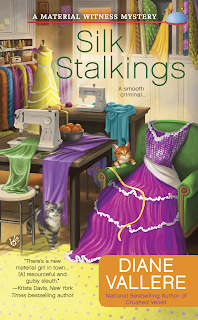 I can't wait to read Silk Stalkings! I met Diane at B&N in Wyomissing on her last book tour. She's a trip! Silk Stalkings - love the play on words. I've put them on my list to try. Any package would be a great win. So many cozy authors I have yet to read. Thanks for the chance to win. Package 1 would be super. I can't wait to read Much Ado about Muffin! Love the series. Awesome prize packages. From the new releases I'm really looking forward to eventually getting to read books from series that are old favorites (Silk Stalkings and Much Ado About Muffin) as well as books from new series (Death Among the Doilies). Thank you all for doing these giveaways. Thank you for having this amazing giveaway. I love all of the books offered. All these books look great. Love Diane Vallere's books, so especially looking forward to Silk Stockings. Thanks for the chance. Awesome giveaway! Silk stalkings grabs my attention, but they all sound great. Interested to read The Diva Serves High Tea. Being a tea fan(atic) I love mysteries that include tea, scones, tea cups, teapots, tea caddies and tea cozies. Irish Stewed is also intriguing - as I am also a collector of "receipts" - especially from the British Isles. Wow! So hard to choose just one! My favorite author is Molly MacRae and I just loved Knot the Usual Suspects! All of the series above look great! I love the cover and title for Clock and Dagger! And it looks great! Thank you so much for the chance to win one of these amazing prize packs! So many books never enough time. Lucky us. 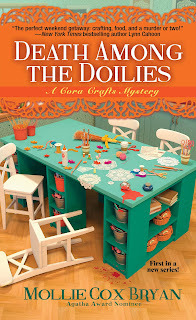 A murdered librarian in Death Among the Doilies! I must get that one. I work in a library and I love reading mysteries with librarians as characters. I'm down to my last cozy mystery book of the summer. I'd love to read these! They all look great (I've even ready three of them, already). #2 is my pick. Karen Chinetti, kchinetti at gmail dot com. What great giveaways! Many books I'm looking forward to reading, including The Diva Serves High Tea, Cracked to Death, Read to Death, and on and on. cwsullivan53 at gmail dot com. Oh, my!! This is a super opportunity to get a set of books on my 'must read' list. Each author is a favorite whose books I have greatly enjoyed. Can't wait for Death Among the Doilies! What a great giveaway! Package #3. Tonya Kappas is great. Would live to read Knot the Usual Suspects and Grimm Reaper. I would love and of the three packages in contest. What a great way to welcome August with such a super giveaway, thanks. Clock and Dagger would introduce me to a new author. Happy August! Thanks for an awesome giveaway! Can't wait to read Much Ado About Muffin! Happy August! Thanks for the chance. sclickner@juno.com. I am looking forward to reading To Catch A Treat. I would love any of the books, and I'd love to read Toasting Up Trouble. What great prizes. Several books are on my TBR. Thank you for the chance to win! All of these books sound great! Cloak and Dagger really caught my eye! Thanks for the chance! What wonderful packages being offered in this fantastic giveaway. All the authors are winners in my book. One of the great things about cozy's is the punny titles. Much Ado Abut Muffin looks like it would be a great read. I'd love to read any of these. MUCH ADO ABOUT MUFFIN is a great punny title. Well, really they all are. How wonderful! They all look great! This is an incredible prize pack! I'm so excited about all of these books! Thank you so much for the chance to win! Sandra rose Pyrosmatches69@gmail.com love the cozy mysteries. Can't wait to read Death Among the Doilies! Awesome prizes. Looking forward to reading "Much Ado about Muffin". Would be awesome to win! Thank you for the chance. 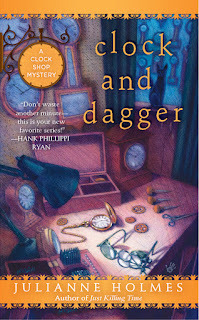 Besides Death Among the Doilies, Clock and Dagger is from a new to me series. what lovely new books! I always love anything with murder and crafting and tea --have some of these tagged already for purchase as soon as they are out! Thanks you for a great give away! I love to read and would be happy with any of them. Read to Death is a great title. Thanks for the chance. All the new releases sound great. I love cozy mysteries. But Much Ado About Doilies sounds really good. I hope to read it very soon. Book prizes are the best prizes! Good luck, everyone! 2boys4me at gmail dot com. Thanks for the chance to win! Clock and Dagger is definitely going on my list! Great post, and thanks for the fabulous giveaway chance! Death Among the Doilies looks like a good one!!! I am always eager to start a new series by reading book #1 in it. I'm about to read Death Among the Doilies and have preordered Much Ado About Muffin. Both of the other books sound great, but have not started those series...yet! Death Among the Doilies is not only a new release, it's also the first book!!! And, I've never heard of it before!!! Great giveaway! I can't wait to read Read to Death! Thank you for the chance. What a great selection of Cozies! Best Wishes to everyone! Clock and Dagger looks great! This is an amazing giveaway. Three people for sure will be lucky! All such wonderful cozies.. I'd like #3 please.. Thanks for such a great giveaway opportunity!